*Indicates SOME models are also available as kits. 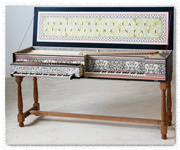 We offer two Flemish single-manual harpsichords. Each design is available in two versions – either in the original range & disposition or a later, enlarged-range version. The large instrument by Ioannes Moermans (GG/BB-f''') is dated 1584. The small instrument by Andreas Ruckers (C/E-c''') is dated 1640. By the 18th century, both instruments would have become valuable but out-dated antiques - perfect for enlargement! Both enlargements are carried out within the original case shape and volume. Our Moermans à petit ravalement has the range GG-e''' (transposing). The Ruckers has the range C-d''' (transposing). Available as a kit (Moermans). The large virginal (mother) is disposed 1 x 8' with a range of 49 notes: C-c"'. The small instrument (child), known as the ottavino, is disposed 1 x 4' and is pitched one octave higher than the mother. It stores easily in the body of the larger instrument, hence the term from the old Flamands, "Mother and Child." 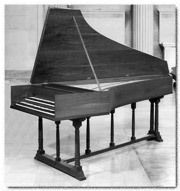 The ottavino can be played either by itself or placed on the mother and coupled to her creating a 1 x 8', 1 x 4' instrument. The instruments can be also purchased separately. The ottavino is an excellent kit for beginners. We offer two. Our 18th century double manual � grand ravalement after Ruckers and Blanchet has the mid-18th century range of nearly five octaves, FF-e''', 61 notes; transposing. The instrument after Ruckers and Taskin adds the top f'''. They are disposed with upper manual 1 x 8', lower manual 1 x 8', 1 x 4', buff stop handstops and shove coupler. These harpsichords offer various possibilities for decoration. For example, block printed papers for the interior of lid and case with a plain or marbled exterior, or the plainer fashion of a French 18th century harpsichord. 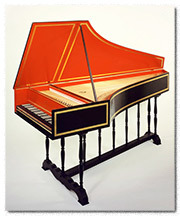 Our 18th century double manual harpsichord after J. D. Dulcken has a range of five octaves, FF-f''', 61 notes; transposing. It is disposed with upper manual 1 x 8' (dogleg), lute, lower manual 1 x 8', 1 x 4', buff stop handstops and shove coupler. 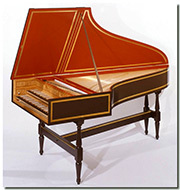 These harpsichords also offer various possibilities for decoration. They are particularly handsome in a simple wood finish or painted in the plainer fashion of a French 18th century harpsichord. This is the real 18th century Flemish double! Our French double-manual harpsichords (we offer six) have ranges of from four and one-half (GG/BB-d''', Richard) to five octaves. Each is disposed with three ranks of jacks and three choirs of strings, 2 x 8', 1 x 4', with a shove coupler. Each instrument is offered painted in a traditional French style, with contrasting interior and exterior colors reconciled by gilded mouldings and accented with gold leaf bands on case and lid. We are delighted to work with customers in pursuit of more 'baroque' decorative schemes, as well. Available as a kit (Taskin). 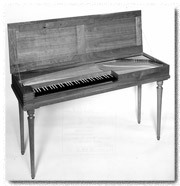 The economy of space allowed by the bentside spinet makes it an ideal instrument for musicians with limited room. The five-octave compass (FF'f''', less FF#, 60 notes) makes it a useful study and practice instrument appropriate to virtually the entire harpsichord literature. Its sound, rich and sonorous, is especially suited to chamber music and the music of the English and Italian virginalists. 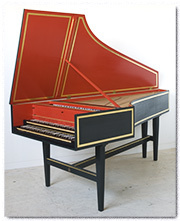 We build two German 18th Century double-manual harpsichords. The "small" double has a range of 61 notes, five octaves, FF-f''', transposing. Its disposition is: upper manual, 1 x 8'; lower manual 1 x 8', 1 x 4', buffstop. The lower manual slides in to engage the upper manual dog-leg jacks. It is available with Delrin or beechwood jacks. The "large" double has the same range. It is disposed: upper manual 1 x 8', lute; lower manual 1 x 16', 1 x 8', 1 x 4', buff stop, shove coupler. It is available only with beechwood jacks. Both instruments are offered in a simple decor - painted in two colors on a matching trestle stand. The keywell surrounds are veneered, inlaid and crossbanded to coordinate well with the ebony and bone key coverings. Our clavichord is based on two surviving instruments by J.C.G. Schiedmayer (1789 and 1791). It is offered constructed from solid oak, cherry or walnut. The cabinetry is finely detailed with hand-cut dovetails, carved keys, handsome black mouldings with brass studs and a flourish at the bass end of the bridge. A simple frame and panel lid and four turned and fluted legs complete the decor. 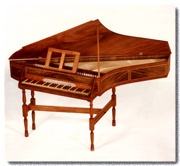 We offer two discrete Italian single-manual harpsichords. In their later, 18th century adaptations they share a range of C - d''', 51 notes and a disposition of 2 x 8'. 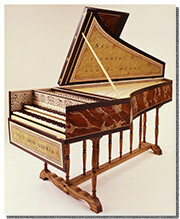 One is largely based on the anonymous instrument of about 1600 in the Raymond Russell Collection, Edinburgh. The other is an instrument of 1619 by Boni. Each is also available in its original range and disposition. Both are lightly constructed of Mediterranean cypress, Port Orford or Alaska yellow cedar, depending on availability. They are provided with turned and carved legs and may also be fitted with a traditional outer case, either painted or veneered in walnut. Our fortepiano is a careful replica of a Stein instrument of 1784 and closely reproduces the tone and action as well as the details of construction of this early piano. Retired from production - we will continue to support & repair existing instruments. 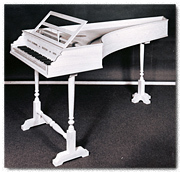 Copyright � 1996-2003 by Hubbard Harpsichords, Inc. All Rights Reserved.